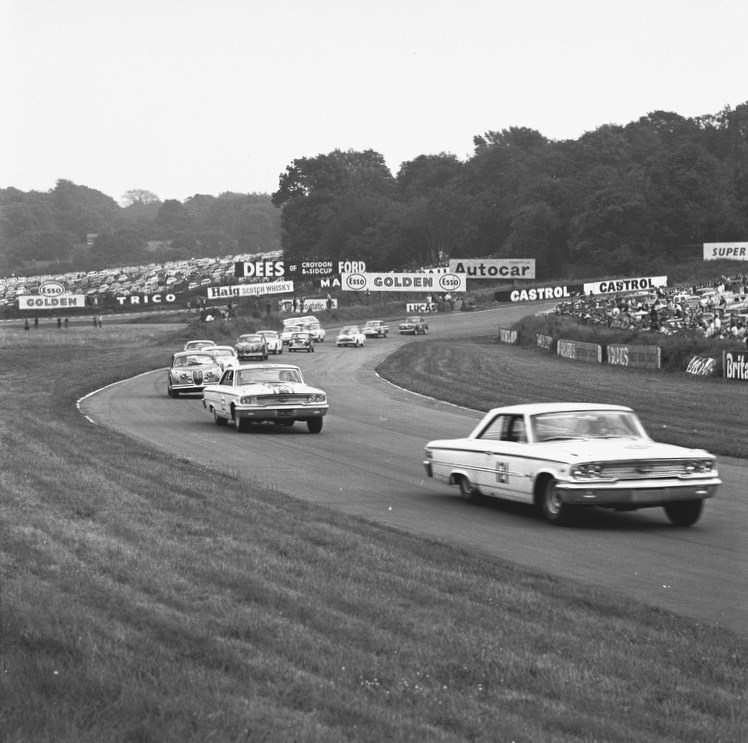 I understand both Jim Clark and Colin Chapman had Ford Galaxie road cars, presumably given to them by Ford. A Lotus Cortina owning friend and fellow rivet counter has surmised they may have been right hand drive versions supplied by Lincoln Cars the concessionares but I think he is indulging in guesswork with that. Has anyone any info on the interesting proposition of these two very enthusiastic drivers navigating the British road network in these imposing vehicles? I cannot think of a bigger contrast in road cars between an Elan Coupe and a 7 Litre Galaxie! Great stuff as usual, Peter. 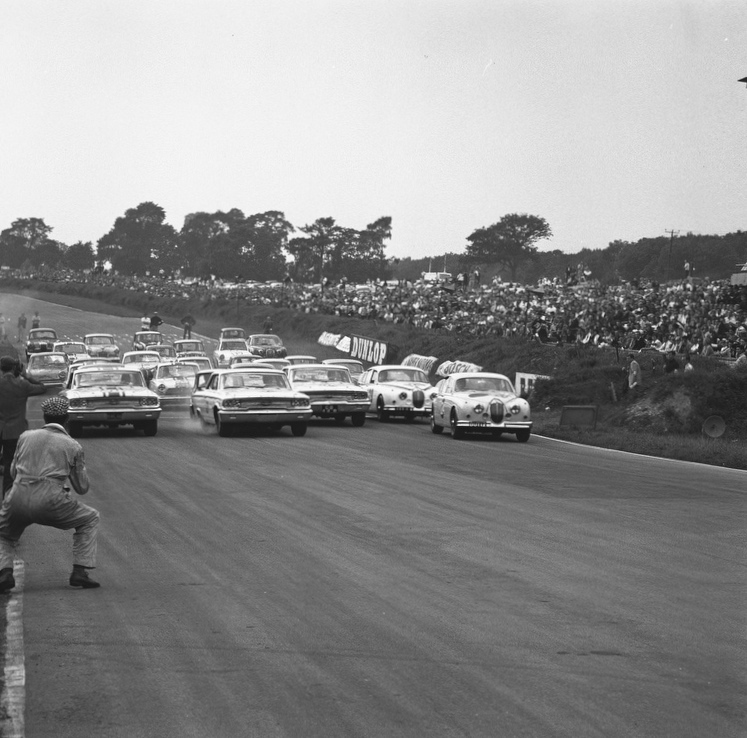 As a ten year-old in Scotland, I remember being glued to our black and white TV whenever (rarely) ‘Grandstand’ showed saloon car races from Crystal Palace, Brands Hatch, etc. Those 7-litre Galaxies, sliding around like bulls on ice, were raw and exciting—and that bellowing sound…. Thanks for triggering that memory. You’re very welcome. I got to see Lex Davison racing the Baillie car in Australia – truly awesome. When you think how small Jim was in stature, and how relatively crude were the seat and belts, it boggles the mind to think about him sliding that car around, absolutely on the limit. Jim loved his Galaxy (used on British roads in 1966) and used to slide it around on the ice in the winter on Scots country lanes. He originally ordered a 1965 Ford Mustang but it was destroyed whilst being loaded onto the docks in England. The Galaxy was the replacement. As far as I know they were both left-hand-drive – as was Jim’s 1967 Lotus Elan S3 Coupe. Thanks again Anders. Yes, it’s extraordinary, I think, that more photographs of Jim in the Galaxy were not published at the time. To me, Jim Clark racing that car was MUCH more significant than the Guards Trophy Sports car race that took place the same day. Back then, though, I guess they were used to the F1 stars sometimes driving in the support events and just took their appearances for granted. I was there. 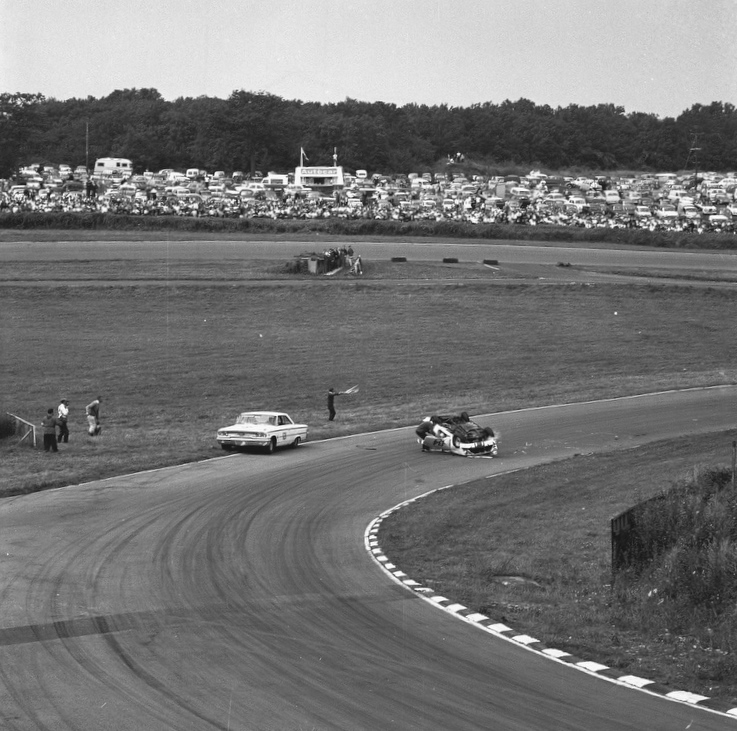 I still remember mentally drooling (during the days before the event) about the unbelievable prospect of Jim Clark driving a Ford Galaxie. 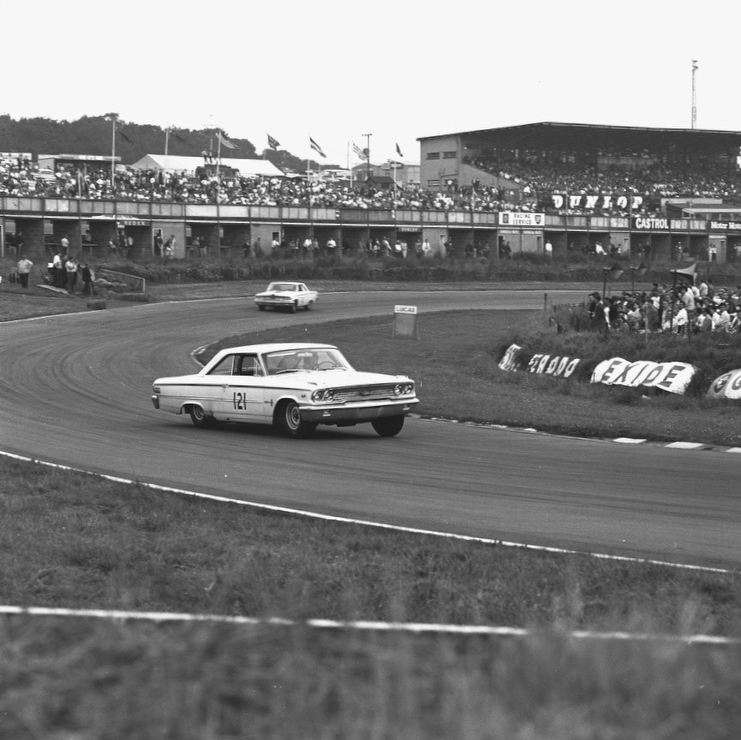 Clark not unsurprisingly set an all-out saloon car lap record in the Galaxie that day, which (if I remember correctly) stood until he broke it again some months/years (?) later in a Lotus-Cortina. I was also there on that second occasion, and (if I remember correctly) he lost a wheel early in the race, got back to the pits for another wheel, and went back out with no chance of a place, but just for fun. 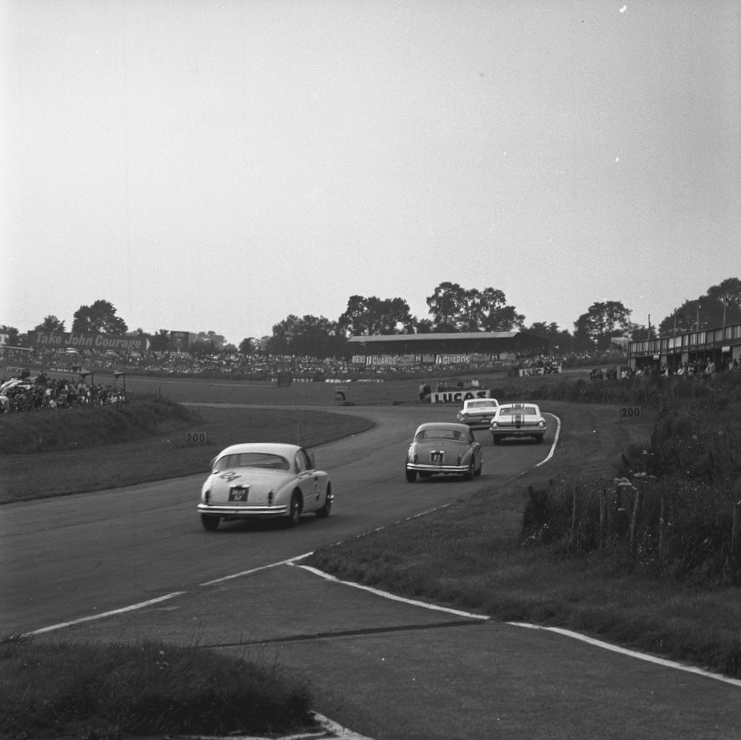 I was standing somewhere along the start-finish straight, more towards Paddock Hill Bend, and had a clear view of the cars coming down from Druids hairpin into the left-hander at the bottom (now called Graham Hill Bend, but I think it had another name back then). Lap after lap Clark threw the Cortina up onto two wheels at the start of that left-hander, and held it that way right through the bend – it was mind-boggling to watch, and I well remember women in the crowd literally screaming with fear every time Clark repeated this feat, lap after lap. Certainly an exciting way to break your own old Galaxie lap record in a Cortina! now THAT was what I called Excitement ! You’re very welcome. Yes – all that Ford France/Ford Germany stuff was exotic to say the least. I hear that Holman and Moody have been commissioned to build special Tour de France versions of the Mustang. Very “Un homme et une femme”. I have just seen this page on the Galaxie..
seemed to make that car work ,I think jimmy might have. Thanks John – a lovely story. I never knew that Jim had a Lotus 7 – so thanks for that bit of info, too. Further to me saying that Jimmy had a Lotus 7,it was abit special in that it had an aluminium hard top which he complained could never be made water tight,if I remember right he drove it around Brands Hatch at the snowed off Boxing day meeting in 1964when people were asked to drive round the circuit to help clear the snow.Alan Mann also drove his TDF Mustang round the circuit.Jimmy also drove this and his Elan around Sir John Whitmores front garden “circuit” at his home Orsett Hall in Essex where he held the lap record in his Elan in competition with Roy Pierpoint,Alan Mann,Don Godden etc.